The Umbrella Cover Museum, which holds the Guinness World Record for the most umbrella sleeves, has chosen Bristol for its first international tour. This quirky collection of umbrella covers from all over the world, along with its Director and Curator, Nancy 3. Hoffman (the three is not a typo – it’s her middle number), will be at Centrespace Gallery, 6 Leonard Lane, from 15-27 September. The motto, “Celebrate the Mundane,” is part of the mission statement, which also declares “There is always a story behind the cover.” The exhibition includes hundreds of umbrella covers, and a chance for visitors to play the game “Mad for Plaid.” A miniature replica of Stonehenge made from umbrella covers and “Kid-Friendly” covers are two of the other exhibits. Nancy 3. 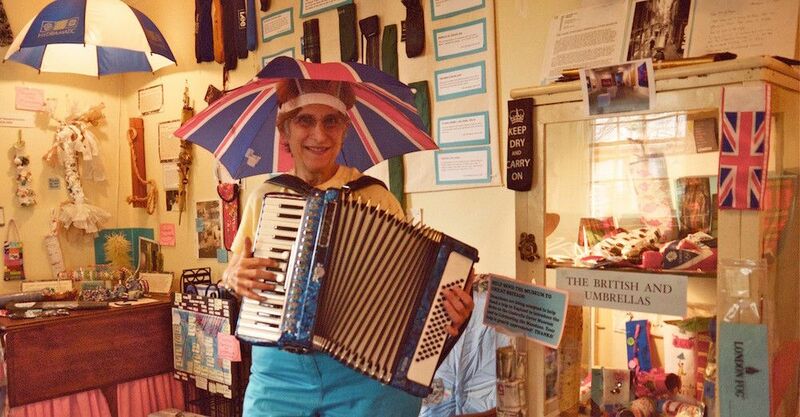 Hoffman has been featured in international media, and was declared the “Favourite Collector of 2014” on Gaby Roslin’s BBC Radio show “Collector’s Corner.” Playing her accordion, Hoffman will “wrap up” each tour with a sing-along rendition of the museum’s theme song. Nancy invites you to please bring along cover if you want to make a donation to the collection.